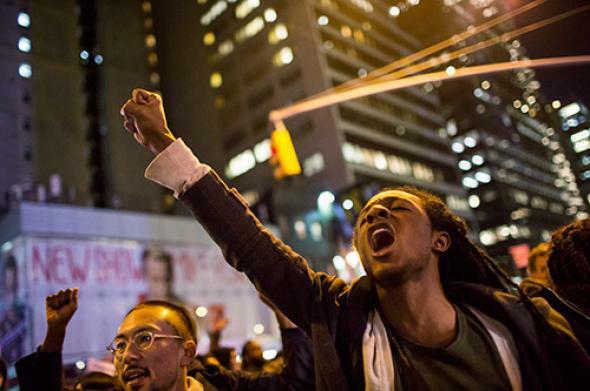 New York City protests over Eric Garner grand jury decision. People take part in a protest against the grand jury decision on the death of Eric Garner in midtown Manhattan in New York Dec. 3, 2014. On Wednesday afternoon a Staten Island grand jury decided not to charge New York police officer Daniel Pantaleo for choking Eric Garner to death. 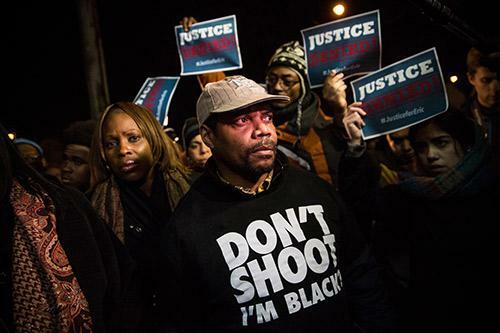 On Wednesday evening, demonstrators took to the streets of New York City to protest the decision. 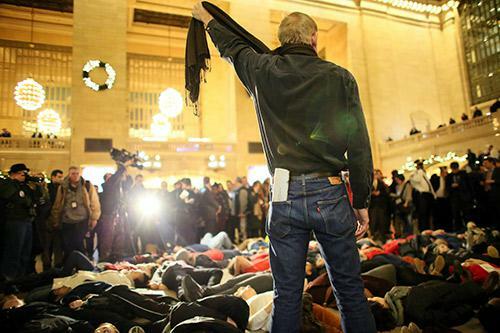 A man symbolically chokes himself with a scarf during a protest in Grand Central Terminal Dec. 3, 2014 in New York. Demonstrators hold an impromptu vigil for Eric Garner, the man who died after being subjected to a chokehold by a police officer in July, outside the beauty salon where the confrontation took place on Dec. 3, 2014, in Staten Island. 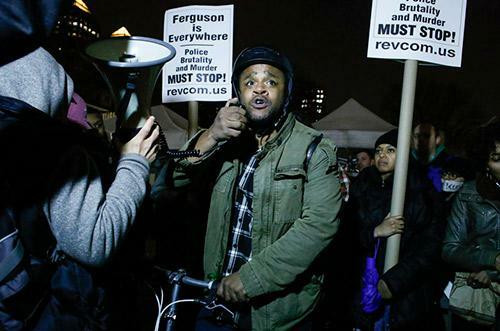 A man speaks on the mic as he takes part during a protest in support of Eric Garner at Union Square on Dec. 3, 2014, in New York City. 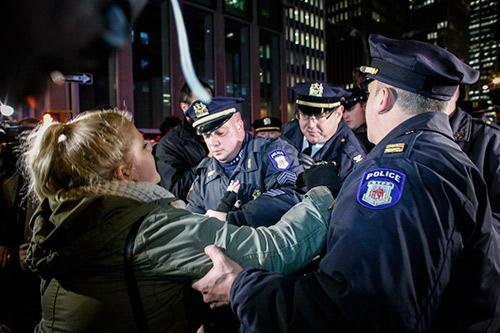 A woman is arrested by police as she takes part during in a protest on 6th Avenue in Manhattan after a grand jury decided not to indict New York Police Officer Daniel Pantaleo in Eric Garner’s death on Dec. 3, 2014. 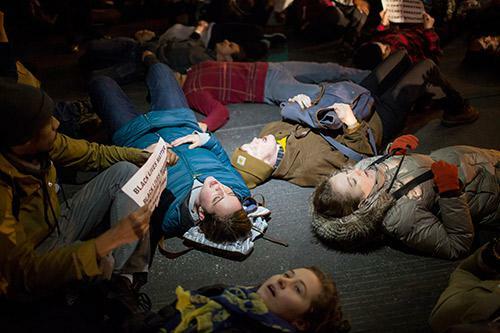 People take part in a protest against the grand jury decision on the death of Eric Garner in midtown Manhattan, Dec. 3, 2014. 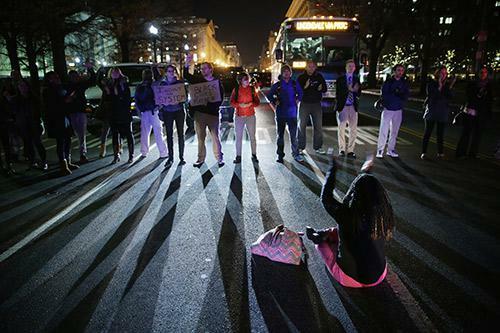 Demonstrators block traffic at 15th Street and Pennsylvania Avenue, NW, during a protest against a New York grand jury decision Dec. 3, 2014 in Washington, D.C.